This is a good shot I took last night at my grandson's school performance. 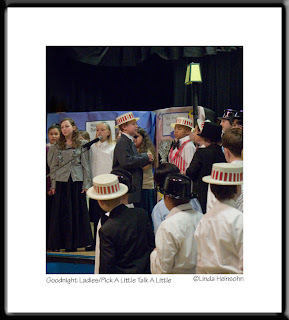 Titled, The Music Man Junior, the half hour presentation of the combined 5th Grade classes was staged with a few sketches and songs from the legendary musical. It's purpose was to give the students an experience with stagecraft and to acquaint them with the historical time period and music. The handsome and clever boy in the center leading the music, Professor Harold Hill, is my grandson, Zack. I was inside with flourescent gym lighting. I had to shoot at 400ISO to get good shutter speeds. Still the color was off a bit and it had a very grainy look. It took quite a bit of work in PSE4 to make this more presentable. This is the first shot I used the Smart Blur filter following a long email discussion in my online photo group. I've never known how to get more of the "pro" look before. It does seem to knock down the edges a bit. Don't know if I achieved the pro look as other photogs do it, but the finished photo looks better to me than the one I started with.